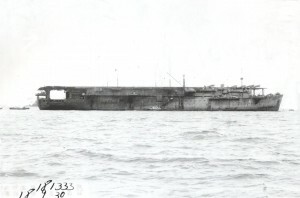 The Ryujo Aircraft carrier formed the 4th Carrier Division 第四航空戦隊 on December 1941 with Kasuga Maru (Taiyō), and the Destroyer Division 3 : Shiokaze, Hokaze. 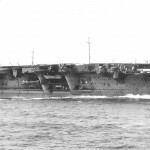 The CVL Ryujo was commissioned on 9 May 1933, 48 aircraft carried, 8,000 tons of normal displacement and 28 knots of speed. Due to the aggregate tonnage dedicated to the Akagi and Kaga (almost 53,000 tones), under the limitations of the Washington Naval Treaty Japan was left with only 30,000 tons of allowable carrier construction. 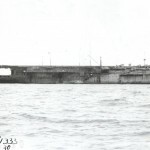 The Japanese, however, were determined to spread this remaining tonnage across as many hulls as possible while still ensuring that each carrier was capable of operating a useful air wing. The result of these irreconcilable design pressures was the Ryujo, a carrier that was supposed to embark forty-eight aircraft, displace only 8,000 tons, and maintain battle speed with the fleet. Not surpringingly, the Ryujo was a failed compromise in a number of respects. Her original aircraft complement having been deemed insufficient after her ordering, a second aircraft hangar was almost arbitrarily placed on top of her original single-hangar design. As built, she was lightly constructed, lacking in longitudinal girder strength and freeboard, and dangerously top-heavy. 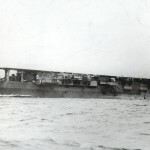 The Ryujo aircraft carrier was badly damaged while on maneuvers in the monster typhoon of 1934, where her structural liabilities were brought into glaring focus. She went back to the yards after a little more than a year in service. 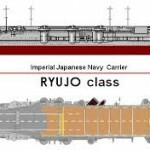 When the Aircraft carrier Ryujo reemerged, her hull had been strengthened, ballasted, and widened. This modification, in combination with the removal of a pair of her 5-inch DP mounts, greatly improved the Ryujo’s stability, but her marginal freeboard had been lowered still further. Subsequent work to heighten her forescastle improved this condition somewhat. However, by 1940 the improvement of combat aircraft had made it impossible for her smaller aft elevator to stow any combat aircraft (except possibly the BN5, which had folding wings), meaning that she was essentially a single-lift carrier. Futhermore, the diminutive size of her flight deck made it impossible for her to operate more than a half-dozen nonfighter aircraft in a single strike package. In all, the Ryujo was of distinctly marginal utility as a light fleet carrier. The Ryujo saw extensive service in the opening phases of the Pacific War, mostly, in support of Japanese amphibious operations. She was sunk on 24 August 1942 during the battle of Eastern Solomons, the victim of four bombs and a torpedo hit that left her a blazing wreck. The Aircraft Carrier Ryuji illustrated in Fujimi model kit box. The CVL Taiyo was commissioned on September 2, 1941. She carried 27 planes, 17,830 long tons, and 21 knots of speed. She was sunk on 18 August 1944 after being hit by torpedoes from the USS submarine Rasher off Cape Bolinao, Luzon. She was one of the three ocean liners converted to troopships during WWII.